Definition of Alliteration: The repetition of the same sounds or of the same kinds of sounds at the beginning of words or in stressed syllables, as in "snowy silver sleighs". Have the group sit in a circle. The first person tells the other players their own first name but adds an alliteration that describes them in front of their first name. For instance, my name is Dana and I might start the game by saying "Hi, I am Delightful Dana." 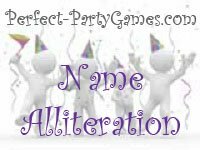 The next player must then repeat the greeting and add their own name and alliteration. For instance, the second player would say, "Hi Delightful Dana, my name is Lucky Larry." Then the thrid person has to say, "Hi Delightful Dana and Lucky Larry, my name is Silly Sam." This continues until the last person in the group has repeated all the names with the alliterations. You could then challenge other players to see if they could also list all the names and alliterations.